In the Rob Papen world of synthesis there was one type of synthesizer missing. A synthesizer that has all of the controls and features available visually all at once. The current Rob Papen collection holds synthesizers which contain many features and types of synthesis which sometimes can be daunting to the average user. But there is always something tempting and fun in something that is so simple! Look at the 1980’s, in which we had top synthesizers like the Roland Jupiter-8, but also at the other end of the spectrum the simpler but fantastic synths like the SH-101. And yes, both became classic synthesizers. Compare it also whilst making music, very often less is more and this is also can be applied whilst using synthesizers. Sure, with a heavily featured synthesizer, you can also be less complex in a patch. But this often still takes more time to achieve. Additional there is a ‘Quick Browser’, ‘Favorties’ and ‘Star’ system in the bank manager. ECS (External MIDI Control) Go2 can modify its sound parameters dynamically in response to MIDI Messages received from an external controller. These settings can be saved and loaded from your HardDisk. Help which opens up Go2’s PDF manual. Go2 Logo Clicking on the Go2 logo takes you to the Back Panel. The Back Panel shows global settings and infrequently accessed controls. 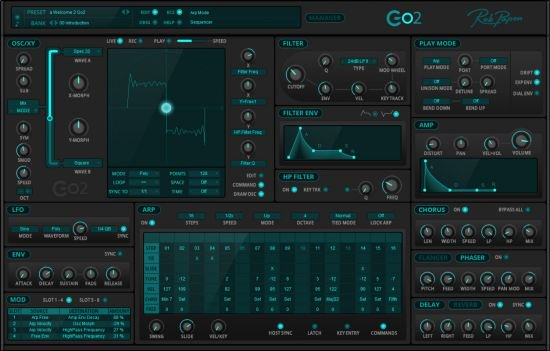 The heart of Go2 is the morph oscillator, this oscillator allows you to morph (using Go2’s various morph modes) between two different waveforms. Oscillator Morph Mode.The Morph Mode menu determines how the oscillator combines the two waves First Wave and Second Wave. The modes are: Mix, Morph, Ring, FM, Inter and Range. Sub. The sub-oscillator knob lets you select two different waveforms being sinus or square..
Symmetry modulation controls how much the symmetry position changes over time. SMOD (Symmetry Modulation) SpeedSmod Speed sets the frequency of the LFO that changes the symmetry position. Edit (While in Edit mode, you can move the path’s points around and thus edit the XY Path manually). Commands (XY Menu with the many additional options like preset path). – Fix with Portamento in Legato mode.